If you wrapped Donald Trump, John D. Rockefeller, H.L. Hunt and Benjamin Franklin all into one man, you’d have Peter Herdic. He looms over Williamsport’s “Lumber Boom Era” like a colossus. Herdic arguably has left a greater imprint on the posterity of Williamsport and Lycoming County than any other man. Born in Fort Plains, New York, on December 14, 1824, he became fatherless twice. In 1837, his mother moved the family to Pipe Creek, New York, where she bought 50 acres of land. Young Peter learned the rigors of outdoor life through farming. At age 20, he worked at a sawmill and saved his hard-earned money, which made possible his first business venture. He came to Lycoming County in 1846 and, along with William Andress, opened a sawmill in Cogan House Township. 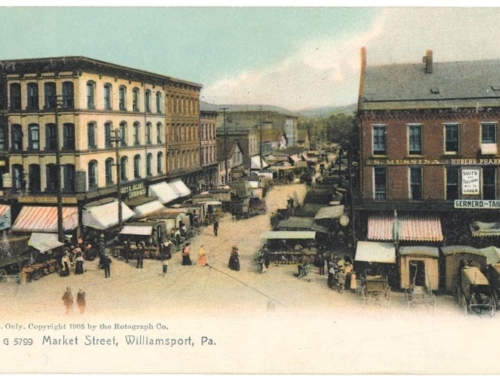 In 1853, Herdic moved to Williamsport, which was then a village of only 1,700 inhabitants. He bought a tract of timberland in 1854 where he erected a steam sawmill. He sold the timber from that land for $10,000 and the sawmill for $1,200. That money was reinvested by Herdic into other timberlands and speculative projects. During the next ten years, he purchased hundreds of acres more of land and built houses, sawmills and other lumber-related industries that helped to power the lumber prosperity that came to Williamsport in the 1850s and 1860s. Herdic’s first wife, Amanda, died in 1856. He then married Encie Maynard in 1860 and she bore him two sons, Peter Jr. and Henry. Encie was the daughter of Judge J. W. Hepburn. Herdic played a major role in the transportation infrastructure in the Williamsport area. He used his political and monetary influence to have the Philadelphia and Erie Railroad move its passenger depot from Pine Street to the area around the present-day Park Home. This was not necessarily a philanthropic gesture on his part since he owned the land and stood to profit greatly from the move. Woodhicks work in the forest, harvesting lumber for the Boom. Herdic was the leading force behind the development of what became “Millionaires Row.” He owned property on this stretch of West Fourth Street, and built several fine houses in the area. He utilized the talents of noted architect, Eber Culver in the design of these houses and structures. The most notable surviving edifice of Herdic’s development is the newly-renovated Park Home that began as the Herdic House Hotel in 1865. Several churches became the beneficiaries of Herdic’s generosity. The most memorable example was the Trinity Episcopal Church, built on property that he owned and at his expense. He also provided the property lot for the Annunciation Catholic Church, and lots for the Congregational Church and the First Evangelical Lutheran Church. Herdic also contributed generously to the building of the first Jewish synagogue in Williamsport, Temple Beth Ha Sholom. It could reasonably be speculated that this ecumenical generosity could have been a form of penance for his questionable financial activities. Herdic was instrumental in having Williamsport chartered as a city in 1866 by the state legislature. He was elected the city’s mayor in 1869. It is believed that it cost him $20,000 to get elected. He often left $10 and $20 bills among the bottles of many saloonkeepers. He was responsible for the annexation of Newberry into the City of Williamsport. Control of the Susquehanna Boom Company in the 1860s help to line Herdic’s pockets further. He used that control to levy high charges on lumbermen needing the boom to get their logs to market. These lumbermen sought relief from the state legislature but Herdic used his money and influence to buy legislators’ votes to protect his interests. Herdic’s big borrowing ways finally caught up with him during the “Financial Panic of 1873.” The financial hard times produced by this “panic” prompted Herdic to declare bankruptcy in 1878. He arose from the financial ashes and engaged in enterprise again and was a leading force in the erection of water works at Selinsgrove and Huntington, Pennsylvania and Cairo, Illinois. It was while at Huntingdon that Herdic slipped on the ice and fractured his skull. This injury resulted in his death on March 2, 1888.